Coincidentally, following the recent hack of a US Navy contractor and theft of highly sensitive data on submarine warfare, we have found evidence of very recent activity by a group referred to as APT15, known for committing cyber espionage which is believed to be affiliated with the Chinese government. 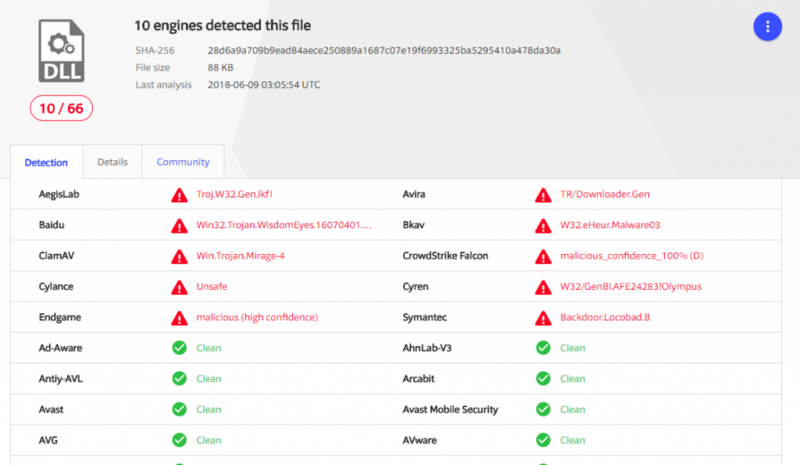 The malware involved in this recent campaign, MirageFox, looks to be an upgraded version of a tool, a RAT believed to originate in 2012, known as Mirage. APT15 is known for committing cyberespionage against companies and organizations located in many different countries, targeting different sectors such as the oil industry, government contractors, military, and more. They are known for “living off the land,” meaning they use already available tools and software installed on the computer to operate, and once inside a target network, they will tailor their malware specifically to the target. Other names for the group are Vixen Panda, Ke3chang, Royal APT, and Playful Dragon. There are many articles and researches online about APT15 and their activities, the most recent one by NCC Group; although posted in March 2018, it refers to a campaign in 2017. In addition, although the 2017 campaign has been documented, during our research regarding MirageFox, we found a recently uploaded binary (6/8/2018) from the 2017 campaign, pretty much identical to a RAT mentioned in their RoyalAPT report, barely detected with only 7/66 detections on VirusTotal. We found the new version of the RAT on VirusTotal hunting, by a YARA signature we created based off code only found in Mirage and Reaver, both attributed to Chinese government affiliated groups. After seeing that these binaries were new uploads to VirusTotal, with very few detections, we analyzed them using Intezer Analyze™ to see if we could find any code reuse. As can be seen in this code reuse analysis report (SHA256: 28d6a9a709b9ead84aece250889a1687c07e19f6993325ba5295410a478da30a), there is shared code with Mirage and Reaver. The compilation timestamp is from June 8, 2018 while the upload date to VirusTotal was June 9, 2018. On VirusTotal, we can see there are only 10/66 detections for this binary, 11/66 for another similar version of MirageFox (SHA256: 97813e76564aa829a359c2d12c9c6b824c532de0fc15f43765cf6b106a32b9a5), and 9/64 for the third MirageFox binary that was uploaded (SHA256: b7c1ae10f3037b7645541acb9f7421312fb1e164be964ee7acd6eb1299d6acb2). Here’s a couple examples of code reuse similarities found in the Mirage family between one of the newer binaries and older ones. The function above is seen throughout many of the binaries in the Mirage family and is executed when a command is sent from the C&C. It is responsible for executing commands in cmd.exe (later down in the functions, not seen in the screenshot, it looks for cmd.exe and executes it using CreateProcessA). At this moment, we were unable to retrieve the original infection vector and other information regarding what other tools the APT15 group is using to attack their targets. We are able to come up with a few very interesting conclusions about what is going on here, although we cannot say for sure what the case is without the full context. Firstly, the reason this has been named MirageFox instead of just Mirage, is because in the Export directory for the modules, the name field is filled with a string MirageFox_Server.dat. Evidently in the image, you can see there is an exported function. 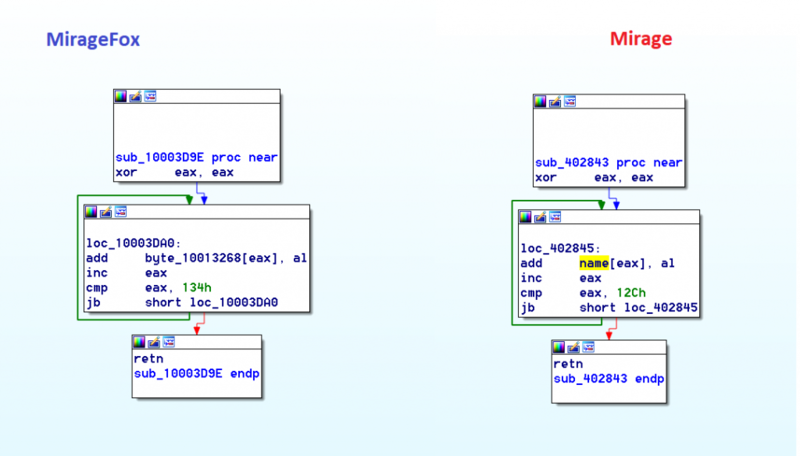 The MirageFox binaries export a function called dll_wWinMain, the name of an export in vsodscpl.dll, a module by McAfee that is loaded by a few of their executables that import and call this function. This most likely means there is some type of DLL hijacking going on by distributing a legitimate McAfee binary with MirageFox to load up the DLL properly into a legitimate looking process. DLL hijacking techniques have been seen in the past with the APT15 group. The problem here is that once the export is called the first time, the module renames itself to sqlsrver.dll and there is no evidence within the module of any type of persistence. By renaming it to this, the future executions of the RAT will not be through a McAfee binary. The future persistence could be setup through another component of the malware or even a command sent by the C&C to the infected computer. The most interesting part is the decrypted C&C configuration, as can be seen in the image below. 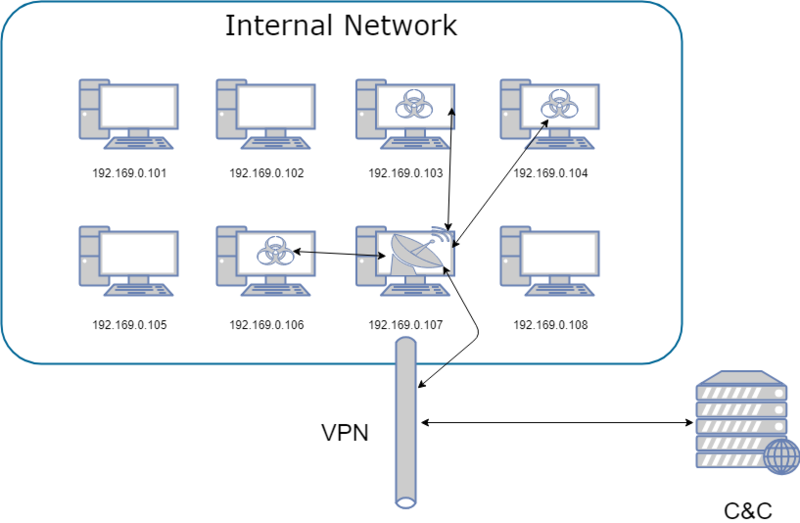 If you look at it the decrypted configuration, you may notice that the IP being used for the C&C is an internal IP address. If you read the report mentioned above about RoyalAPT by NCC Group, it is mentioned that APT15 infiltrated an organization again after stealing a VPN private key, therefore we can assume this version was tailor made to an organization they have already infiltrated and are connecting to the internal network using a VPN. 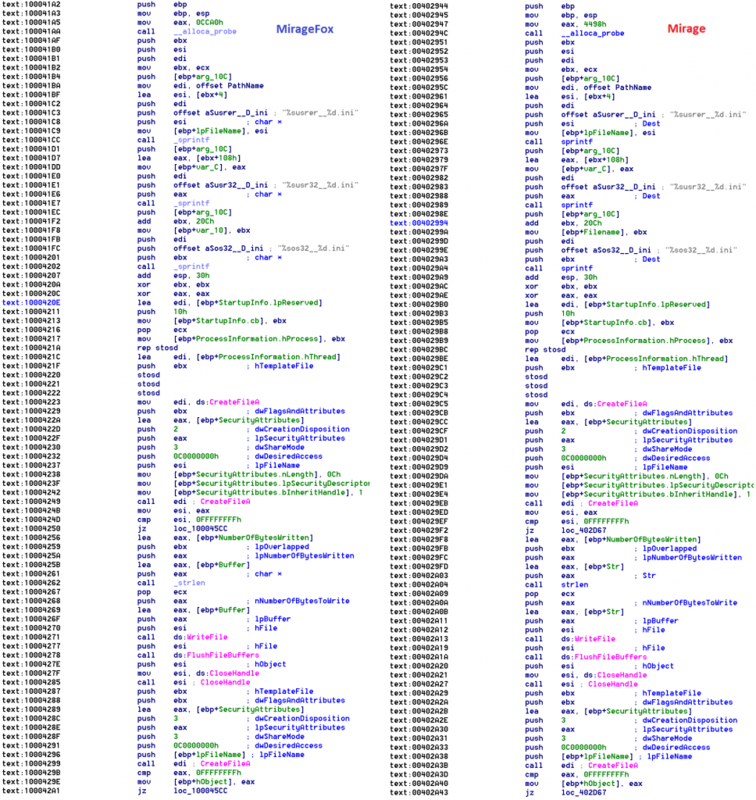 The rest of MirageFox functions similarly to previous malware created by APT15, first collecting information about the computer like the username, CPU information, architecture, and so forth. Then it sends this information to the C&C, opens a backdoor, and sits waiting for commands from the C&C with functionality such as modifying files, launching processes, terminating itself, and more functionality typically seen in APT15’s RATs. 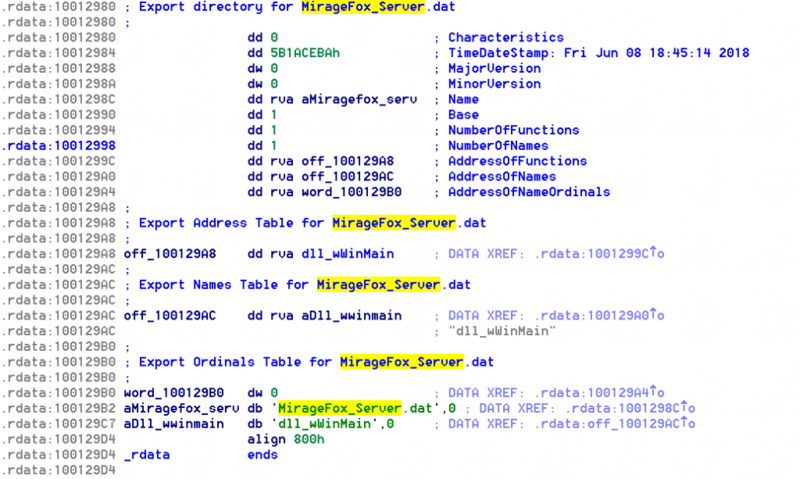 There is high confidence that MirageFox can be attributed to APT15 due to code and other similarities in the MirageFox binaries. As is known about APT15, after infiltrating their target, they conduct a lot of reconnaissance work, send the commands from the C&C manually, and will customize their malware components to best suit the environment they have infected.